How do I improve my HotelTechScore? Remember, the HotelTechScore is a normalized metric to signal quality. Think of it like you would REVPAR for hotels--but instead of rate and occupancy its review quality x quantity x freshness/recency. Goal #1: Get 25 verified reviews. Research has shown that buyers trust profiles with more than 25 reviews so this is your first goal. You can find the minimum review threshold for your category right in the vendor dashboard. Get above this number to increase your score. Buyers want to know that your company and product is a good fit for their type of property. Make sure your profile features reviews from hoteliers in each of your target segments and each of the geographies that you serve. 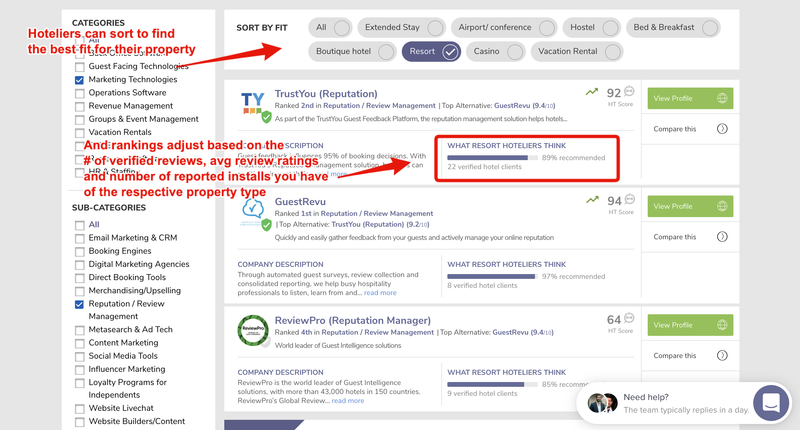 Make sure you have recent reviews on your profile to meet the Share of Voice criteria to give hoteliers real time insights into your current product offerings while signaling to them that your install base and pool of satisfied customers is growing.